Our metal restoration services encompass any architectural metal surface found on buildings today. We have performed metal restoration services for some of the most prestigious buildings in the nation. The most common types of metal restoration we provide include aluminum composite panel restoration, anodized aluminum window frame restoration, and the restoration of various types of architectural steel surfaces. Our composite panel restoration services can effectively restore any type of aluminum composite material. When performing aluminum composite panel restoration services, it is important to thoroughly restore the surface without damaging it in the form of scratches, dents, or burns. We have effectively restored composite panels on high and low rise architectural surfaces with great success. When choosing an aluminum composite panel restoration company, it is important to get a mock up of the restoration services on the surface in order to ensure that the expected results will be achieved without damaging the surface. We can provide quality demonstrations of aluminum composite panel restoration for low budget aluminum restoration. Anodized aluminum window frames are often stained by precast and painted surfaces as water introduces contaminates to the anodized surface, and these contaminates are allowed to remain on the anodized surface for a period of time. 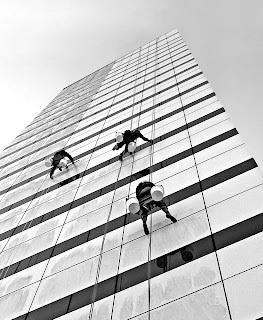 Soap, used during the window cleaning process, is often left on the anodized surface when the windows are cleaned. As the soap dries, a sticky residue forms, providing an effective glue for contaminates to attach to the window frames. To learn more about how and why stains form on anodized aluminum window frames visit the About Metal page of Presto Restoration Products, a company that specializes in the development of high performance products to not only remove the stains but prevent them from returning..
Our anodized aluminum window frame restoration services include the removal of concrete, rust stains, mineral stains, and even corrosion from the anodized surface. 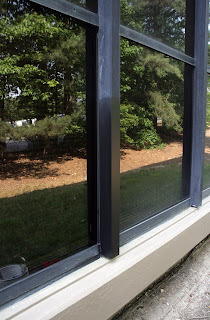 When compared to other anodized aluminum window frame restoration companies, we are often able to restore window frames which other companies recommend painting over. We rarely recommend painting anodized aluminum window frames due to the cost of future upkeep. Typically we can restore most anodized surfaces in order to return the original luster. Give us a call today to see how our anodized aluminum window frame restoration company can meet and exceed your service requirements. To view anodized aluminum restoration before and after pictures. Our architectural steel restoration services include any type of architectural steel on your structure. We can restore steel stair casings, metal railings, steel structural components, decorative stainless steel, and any other steel surface requiring restoration. We have been contracted to perform steel restoration services over the years which completely restore the intended appearance to bare steel as well as painted surfaces. For more information regarding our effective processes for architectural steel restoration give us a call. We want to be your metal restoration company of choice. Call us today in order to receive a free, no obligation quote in order to determine the cost of your metal restoration project.